Hamilton is diverse, but is its audience? The Broadway musical Hamilton is a cultural phenomenon. Its style is unprecedented, its box office receipts are record-breaking, and Lin-Manuel Miranda – its writer, composer, and star – is electric. From the Grammys to 60 Minutes to your Facebook News Feed, Hamilton is everywhere. And given what you see, hear, and read, it’s easy to start to think that "everyone" – or at least "everyone" in New York – is going to see it. Whatever that means. While we shouldn’t take Gladwell’s “everyone” reference too literally, his remark is notable in that it is un-Gladwellian. It seems the writer who brought some of the hidden effects of social networks and unconscious bias into the mainstream fell victim to the very social phenomena he helped popularize, proclaiming that “everyone” in New York City is going to see Hamilton, when in fact that “everyone” is more likely limited to people in his network. At the very least, Gladwell’s comment is cause for inquiry, prompting us to take a deeper look at just how many people are actually going to see Hamilton, and who those people are. Let’s explore. How many people have seen Hamilton? Let’s start with the more straightforward question of how many people have seen Hamilton. We’ll include Off-Broadway and Broadway, previews and official performances, and assume no one’s seen it more than once. Off Broadway, Hamilton ran at the Public Theater in Manhattan’s East Village from January 20, 2015 through May 3, 2015 – a total of 104 days. We don’t have Hamilton’s exact performance schedule, but the theater generally runs eight shows per week, meaning there were around 119 Off-Broadway performances of Miranda’s hit musical. The Public houses five distinct venues; Hamilton ran in its largest, the Newman Theater, which has 288 seats. And it appears the show was sold out from the very start, with secondary market tickets starting at $500 on Craigslist hours before its official Off-Broadway opening on February 20. 119 performances to 288 people means that about 34,000 saw Hamilton Off-Broadway. On Broadway, Hamilton opened for preview at the Richard Rodgers Theatre on July 13, 2015. February 29 marked 232 days running, and at eight performances per week, that’s 265 Broadway shows. The theater’s published capacity is 1,319 – and the show is most definitely sold out – so around 350,00 people have seen Hamilton on Broadway. In total, we estimate that 384,000 people have seen Hamilton. How many New Yorkers have seen Hamilton? The question of how many New Yorkers have seen Hamilton is a little trickier. Here we’ll define New Yorkers those who reside in one of the city’s five boroughs. During the 2014-2015 season, 17.7% of the Broadway audience was from New York City – 9.1% from Manhattan and 8.7% from Brooklyn, Queens, the Bronx, and Staten Island. The New York City suburbs accounted for 15.6%, the rest of the U.S. accounted for 49.2%, and internationals accounted for 17.5%. Musicals draw a slightly lower percentage of New Yorkers than do Broadway shows as a whole (which include non-musical plays). Winter draws a slightly higher percentage of New Yorkers than do the other seasons. And while the publicly available evidence on this is thin, we'll assume that Broadway hits start off with higher concentrations of New Yorkers and Manhattanites. We adjusted our projections based on these factors, estimating that New Yorkers account for 23.6% of the 350,000 people who have seen Hamilton on Broadway through February, for a New York City total of 82,500. Off-Broadway Theater attracts a higher concentration of New Yorkers than do Broadway shows, as well as a higher concentration of Manhattanites within its New York City audience. We estimate that New Yorkers made up 42.2% of the 34,000 people who saw Hamilton Off-Broadway, for a New York City total of around 14,500. Overall, we estimate that 97,000 New Yorkers have seen Hamilton, or 1.1% of New York City’s 8.5 million people. ﻿Who goes to Broadway shows? Now that we have an idea of how many New Yorkers have seen Hamilton, let’s consider who goes to Broadway shows, using the Broadway League’s “The Demographics of the Broadway Audience, 2014-2015” as our primary reference. Among New Yorkers, Manhattanites and whites are disproportionately represented at Broadway shows. One in five New Yorkers lives in Manhattan (19%), but one in two New Yorkers who go to Broadway shows lives in the borough (51%). One in three New Yorkers is white (33%), but 72% of New Yorkers who go to Broadway shows are white. Broadway audiences are also affluent. The average household income for American theatergoers last year was $205,366 – four times the United States average and in the top five percent nationally. Showgoers from New York City had an average income of $175,200 – over three times the city average and in the top ten percent for New York. While the overall demographics of the Broadway audience are informative, they leave us to speculate on a number of Hamilton-specific factors. For example, Broadway shows or major hits might initially attract even more local crowds than we adjusted for above, which would add more New Yorkers to our previous estimate. Then again, transcendent shows are historically – and unsurprisingly – wildly popular with both tourists and locals. Hamilton’s tickets sell on the secondary market for several times the Broadway average - their average starting price for the next sixty shows is $600 - so its audience may well be even more affluent than is typical. On the other hand, the show is such a sensation that some fans have been willing to pay no matter what. Nevertheless, we know enough to know that about one percent of New Yorkers have seen Hamilton, and it is likely that most occupy some sort of upper or upper middle class. So while everyone in Gladwell's New York City might be going to see Hamilton, it's pretty safe to say that everyone in New York City is not. And it serves as a reminder to all of us to think beyond our own circles and norms, as Malcolm Gladwell would otherwise have us do, and challenge the status quo, as Lin-Manuel Miranda has so powerfully done with Hamilton. Our reference to Gladwell’s comment is not intended as an overly literal or overly critical interpretation of something he said in the middle of a free-flowing conversation. But it was memorable and ironic for the reasons described above, and it truly was the origin of this article. Whatever your opinion of Gladwell's style or at-times "cherry-picked" science may be, we've read his books in the past and have him, at least in part, to thank for encouraging us to question assertions like the one he made on the Simmons Podcast. Our primary source for "who goes to Broadway shows" is The Demographics of the Broadway Audience, 2014-2015, published annually by the Broadway League since 1998. The complete 55-page report is available for sale on the League's website. For those interested in audience trends, ticket purchasing habits, and consumer preferences, the report is a very good read. We certainly welcome more nuanced input (e.g., on whether Broadway audiences are indeed more "local" when plays open) and more specific input (e.g., on the Hamilton audience) if available and substantiated. Now that Hamilton is such a sensation, it is fascinating (and a little bit funny) to go back and read its Off-Broadway reviews, articles wondering "how it will be received by broader audiences over time", whether it could sell out the Richard Rodgers Theatre, and whether it would be "the next 'Book of Mormon' ... or 'Bloody Bloody Andrew Jackson'", which closed in three-and-a-half months after a hit run at the Public. If all of that sounds ridiculous to you now, then you might check out Malcolm Gladwell's article "Connecting the Dots", an interesting read on hindsight bias. In October 2015, a partnership was announced between Hamilton, The Rockefeller Foundation, Gilder Lehrman Institute of American History, and NYC Department of Education "to provide 20,000 NYC public school students with the opportunity to see Hamilton on Broadway and integrate the show into classroom studies. The educational initiative is made possible through a $1.46 million grant by The Rockefeller Foundation to Gilder Lehrman." Hamilton recorded $57M in advance sales, which its production sources claim is a record. Per Playbill, The Broadway League does not track advance sales and The Book of Mormon does not disclose their figures publicly, so we can't confirm for sure. In any case, Hamilton has propelled Broadway to record-breaking weeks and is itself breaking Billboard chart records. How prominent Hamilton is in your Facebook News Feed and how "everywhere" it feels to you speak to your own social circles, just as they do ours, Gladwell's, and everyone else's. ​​ We have elected to hyphenate Off-Broadway as a standalone name ("Off-Broadway") or adjective (e.g., "Off-Broadway Theater"). We do not hyphenate at the start of the next sentence, as we are there referring to it as a geographic place ("Off Broadway"). Check out this interesting Wikipedia debate regarding its hyphenation. Certainly some fans have seen the musical more than once, including First Lady Michelle Obama, but there's no sound way to estimate how many have done so, and it's likely very few, so we'll go with one per person, even if doing so overstates the total number of people or total number of New Yorkers a little bit. The Public Theater is located at 425 Lafayette Street, which many would argue is just west of the East Village, in NoHo. Nevertheless, many sources refer to the Public and its predecessor, the Astor Library, as being in the East Village, and some claim the East Village goes as far west as Broadway. NoHo is probably more accurate, if less recognizable outside of NYC. The Newman Theater can hold up to 299 people, but it appears that in practice it holds slightly less. Current seating for Head of Passes allows for an audience of 288. We later discovered this New York Times article, which notes that “a total of 34,132 seats were available over [Hamilton’s] 15 weeks at the Public”, affirming our estimate of 34,272. 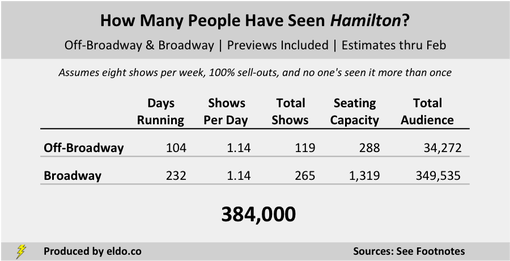 Rather than simply quote the article, we think it’s interesting to get a feel for the number of days and seats involved in Hamilton’s Off-Broadway run, so we left the math in. 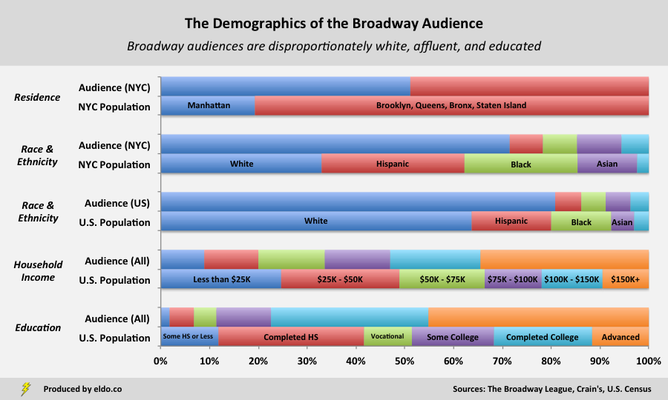 The Broadway League, "The Demographics of the Broadway Audience, 2014-2015". The League includes Nassau (NY), Suffolk (NY), Westchester (NY), Rockland (NY), and eight New Jersey counties in their definition of NYC suburbs, which is a fairly tight definition. That serves to understate "NYC suburbs" and overstate "U.S. domestics". Figures might not add evenly due to rounding. ​ Through February, we calculate that Hamilton has run on Broadway for 71 summer days, 91 fall days, and 70 winter days. The Broadway League reports the place of residence for the Broadway audience (musical and plays combined) by season and in four categories (NYC, NYC Suburbs, Other U.S., and International). We weighted the figures according to the seasons in which Hamilton has run to date and adjusted them to reflect that musicals draw slightly less from NYC (15.2%) than do Broadway overall (17.7%) or non-musical plays (31.9%). We then inflated the Manhattan percentage by 40% and the Other NYC percentage by 20% to allow for the notion that hit musicals are disproportionately attended by New Yorkers and Manhattanites in early stages of their Broadway life cycle. ​ Off-Broadway demographic data is more difficult to find. We referenced The Theatre Development Fund's "The Audience for New York Theatre: A Profile of the Broadway and Off-Broadway 1997 Theatre Season" as a base, adjusting its "NYC residents" figure (47.8% in 1997) according to an average of two 1997-2015 Broadway trend calculations (to 42.2% in 2015), while projecting that its "Manhattan to other NYC borough" ratio would mirror its "NYC to NYC suburbs" ratio, with 61% of the Off-Broadway's NYC audience residing in Manhattan. The U.S. Census estimates New York City's population to be 8,491,079 as of July 1, 2014. Population figures are per the U.S. Census; Broadway audience figures are per the Broadway League. We also referenced NYC population data reported by Crain's in order to clarify some overlap in race and Hispanic origin data, namely the fact that in standard U.S. Census reports "Hispanics may be of any race, so also are included in applicable race categories". ​ Average household income for American theatergoers is a weighted average of the Broadway League's average household income by residency type (NYC, NYC Suburbs, Other U.S.) and the percentage of each resident type within the Broadway audience. The report does not specify whether the average is a mean or median. Median U.S. household income is $53,482 (2010-2014, in 2014 dollars) per the U.S. Census. Percentile estimates are per CNN Money and The New York Times. ​ Average household income for New York City theatergoers is reported by the Broadway League, which does not specify whether the average is a mean or median. The median would certainly be important in analyzing Hamilton, as its audience includes several high-profile, exorbitantly wealthy celebrities. Median NYC household income is $52,737 (2010-2014, in 2014 dollars) per the U.S. Census. Percentile estimates are per The New York Times. Broadway audience education figures are per the Broadway League; U.S. population education figures are per the U.S. Census via the Broadway League. Through February, an estimated 18.6% of New Yorkers who saw Hamilton, saw it Off-Broadway, further elevating the overall education level of Hamilton's NYC audience. Though not by much. Even if Hamilton's audiences were comprised of twice as many New Yorkers as the average Broadway show, still only 1.45% of New Yorkers would have seen Hamilton thus far. By a lot. This is an unscientific example, but the six other shows listed on the front page of TiqIQ on March 3 had an average price of $138. Hamilton was showing for $690 (5x). Precise class distinctions are somewhat arbitrary and vary among sociologists and economists. They're also relative to cost of living. If you're a Manhattanite who read this and balked at being referred to as upper middle class, check out this New York Times article. In any case, we know that the average Broadway theatergoer is in the 95th percentile for household income in the U.S. and we know that the average NYC resident Broadway theatergoer is in the 90th percentile for the NYC area. And while we don't know exactly who is in the Hamilton audience, we do know that Hamilton tickets are five times more expensive than the Broadway norm. We are comfortable asserting that "most [of the Hamilton audience occupies] some sort of upper or upper middle class".